It's a design by Hokusai, signing "Saki no Hokusai Iitsu hitsu" (前北斎為一筆), originally published about 1833. 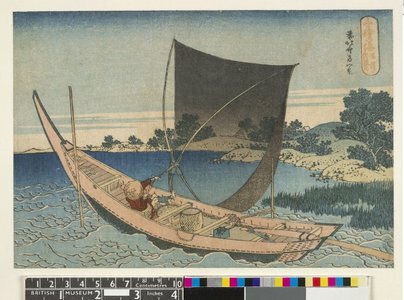 This design is "Sōshū Tonegawa" 総州利根川 ("The Tone River in Sōshū Province") from the series "Chie no umi" 千絵の海 ("A Thousand Pictures of the Sea"). As you can see, the publisher of this reprint has modified the design slightly, removing the title cartouche and moving the signature a bit to the right.